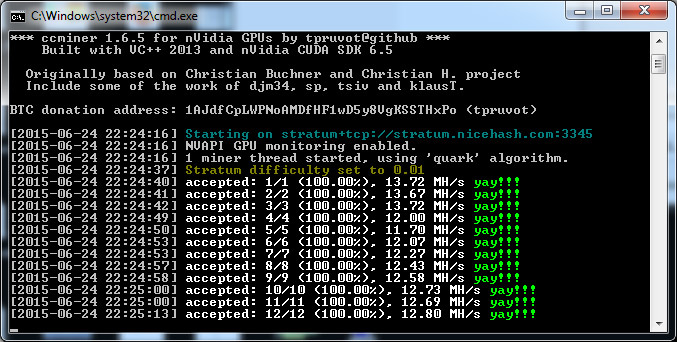 We have compiled a new up to date Windows binary from the latest ccMiner 1.6.5-git by tpruvot (source). The latest version includes numerous improvements and fixes, including basic support for CUDA 7.0, though apparently it is running slower when compiled with it. There are performance optimizations for the following supported algorithms: qubit, deep, luffa, x11 and quark as compared to the previous version. Our windows binary is compiled with VS2013 and CUDA 6.5 and supports Compute 3.5, 5.0 and 5.2 GPUs. You can download and try it below, there is an example BAT file setup for testing the multiple pool support.